Happy 79th Birthday, Pope Francis! (Vatican Radio) Pope Francis received a birthday cake from Mexican journalist Valentina Alazraki during his weekly general audience on Wednesday. The cake was shaped like a Mexican sombrero, and was presented to the Holy Father a day before he turns 79-years-old. Pope Francis and the "Peace Light of Bethlehem"
The program was begun in 1986, and aims to raise awareness for the peace process in the Holy Land, as well as support handicapped children and other people in need. The flame, which is lit at the Basilica of the Nativity in Bethlehem and flown in a special container to Austria, is brought by Scouts and Guides throughout Europe. Vatican City, 16 December 2015 (VIS) – The report of the Moneyval Committee, dated 8 December, confirms that during the last two years the Holy See and Vatican City State have achieved significant progress in the construction of an adequate and functioning institutional and regulatory framework for preventing and combating money laundering and the financing of terrorism (c.f., in particular, paragraphs 18-19: Vatican tribunals have frozen 11.2 million Euros as a result of the current investigations). With regard to the Office of the Promoter of Justice, the investigations are complex from a technical point of view, and require careful analysis. They have a strong international or transnational dimension, involving offences committed outside Vatican territory and persons from outside the Vatican (c.f. Paragraph 18). The Holy See has established an international network that enables it to collaborate actively with other States in these cases, at the levels of both the AIF and the tribunals. The information and statistics contained in the Report demonstrate this clearly. The Vatican Tribunal requested and received reciprocal legal assistance (letters rogatory) from other States. The Report confirms that mutual legal assistance is widely used (paragraph 79). (Vatican Radio) Pope Francis received Birthday Wishes and a celebratory cake on Thursday as he greeted members of the Italian “Azione Cattolica” movement thanking them for their commitment to welcome migrants. It was a special morning in the Vatican as a large group of children and young people who belong to the non-political lay organization sang “Happy Birthday” to the Pope as he received them for the annual Christmas audience on the day that marks his 79th birthday. In a festive atmosphere, the Pope commended them for their desire to live the Gospel to the full, and for their mission to involve family members, parishes and communities in an actively Christian life. He said that by participating actively in the Mass and in Catechism, they become like missionaries and are able to bring Jesus to others. (Vatican Radio) Pope Francis on Thursday said today’s globalization of indifference is rooted in a distorted or unbalanced humanism in which “man has taken the place of God and therefore has become in turn a victim of various forms of idolatry.” At the same time, he pointed to a positive development, saying we are witnessing from those with more mature consciences a growing “non-violent reaction” to the wars and terrorism that have marked this year. The Pope’s remarks came in an address to the Ambassadors from India, Latvia, Guinea and Bahrain to the Holy See who were presenting their Letters of Credence. (Vatican Radio) Pope Francis will on Friday open a Holy Door at a newly refurbished homeless centre run by the Church near Rome's main train station. Lydia O'Kane went along to see the newly completed project which offers a bed, a meal and ray of hope to hundreds of people every night. As you arrive at the Holy Door of the Caritas centre for the homeless at Rome’s Termini Station you can’t fail to notice the mosaic logo of the Year of Mercy depicting Jesus the Good Shepherd by Marko Ivan Rupnik. The door will be opened by Pope Francis on December 18th and he will also have the chance to see for himself the newly refurbished night hostel and canteen which are named after Caritas Rome founder Don Luigi Di Liegro and Pope Saint John Paul II. Pope Francis has opened the door to the canonization of Blessed Mother Teresa of Calcutta. He did so this afternoon, Dec 17, when he recognized the miraculous cure of a Brazilian man that took place at the end of 2008. The news was broken unofficially this evening by the Italian Catholic daily - Avvenire's well informed columnist, Stefania Falasca, but it was not unexpected. It came after the commission of cardinals and bishops of the Congregation for the Causes of Saints gave their unanimous positive verdict on Dec 15, thereby confirming the unanimous conclusion reached by the congregation’s own medical board on Sept. 10 that the Brazilian man’s cure could not be explained scientifically. New film tells of faith struggles amid charity. (Vatican Radio) The Church in Poland has submitted a Mobile App to the Pontifical Council for the New Evangelization to help people live out the Jubilee Year of Mercy. The App – called Misericors – was given to the Council on Thursday, as a “birthday gift” for Pope Francis. The Misericors App is interactive, and helps the users to practice mercy in their daily lives, as well as spurring them to personal and community prayer. “Misericors is an interactive application for our smartphone – in the Polish language, but also in 8 other languages…English, German, French and son” said Father Józef Kloch. 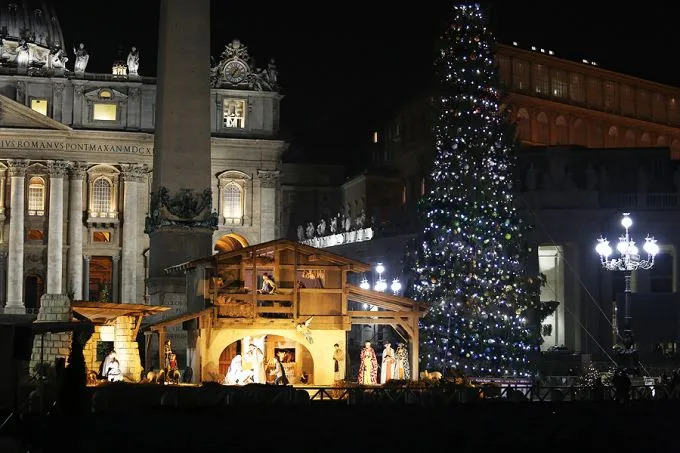 Vatican City, Dec 18, 2015 / 11:52 am (CNA/EWTN News).- Pope Francis greeted the donors of the Christmas tree and the Nativity scene in St. Peter's Square on Friday, recalling that Christ's birth in the manger shows that he never imposes himself upon us. “He makes himself small, he becomes a child, to attract us with love, to touch our hearts with his humble goodness,” Pope Francis reflected Dec. 18 at the Vatican's Paul VI Hall. Pope Francis opens the Jubilee Holy Door at a homeless centre in Rome's Termini - John Paul II train station. (Vatican Radio) Pope Francis on Friday visited a new homeless shelter in Rome’s Termini – John Paul II train station, where he opened a Holy Door for the Jubilee of Mercy. It was the fourth Holy Door opened in Rome, following the solemn opening of the Doors at St Peter’s Basilica and the Archbasilica of St John Lateran by Pope Francis. The Holy Door at St Paul’s Outside-the-Walls was opened by Cardinal James Harvey, the Archpriest of the Basilica. The fourth Papal Basilica, St Mary Major, will see its Holy Door opened by the Pope on the Solemnity of Mary, the Mother of God on January first. The decision to open a special Holy Door of Charity at a homeless shelter is a unique feature of the extraordinary Jubilee of Mercy, designed to emphasize the centrality of concrete works of charity in the life of the Church. Following the opening of the Holy Door, Pope Francis celebrated Mass at the Centre. (Vatican Radio) Pope Francis received managers, technical staff and personnel of the Italian State Railway on Saturday, in a special audience. Some 7 thousand employees of the Ferrovie dello stato packed the Paul VI audience Hall for the noon appointment. In remarks prepared for the occasion, Pope Francis praised the organization and its employees for their historical commitment to works of solidarity and compassion, including their support for the recently concluded renovations of the Caritas center near Rome’s central station, which the Holy Father visited earlier this week in connection with the Jubilee Year of Mercy. (Vatican Radio) Pope Francis prayed the Angelus with faithful pilgrims and tourists gathered in St. Peter’s Square on Sunday, ahead of which he spoke of the spirit of wonder engendered by the Gospel and especially by the Christmas season. Reflecting on the Gospel reading of the 4th Sunday of Advent, which recounts Mary’s visit to her cousin, Elizabeth, miraculously with child in her old age, Pope Francis indicated three loci of wonder in our lives: the other; history; and the Church. (Vatican Radio) Pope Francis on Sunday blessed the figures of the Christ Child, which shall be placed in the mangers of Christmas crèches in and around Rome and throughout Italy this Christmas season. The Pope gave the traditional blessing on the day of the “children’s Jubilee” – a Year of Mercy celebration devoted especially to children and young adolescents. Pope tells Roman Curia to "return to the essentials"
(Vatican Radio) Pope Francis has urged the Roman Curia to “return to the essentials” and follow a path of gratitude, conversion, renewal, penance and reconciliation as indicated by the Year of Mercy. The Pope was addressing members of the Curia gathered in the Vatican Clementine Hall for the annual Christmas Greetings. Recalling briefly this same occasion last year during which he made a long list of curial diseases that adversely affect and infect the Church, Pope Francis said that some of those “diseases became evident in the course of the past year, causing no small pain to the entire body and harming many souls”. Reiterating his determination to move forward with ecclesial reform – which is necessary, he said, to allow us to “advance on the path of goodness” - he recited another long list: a “catalogue of needed virtues” – a practical aid – he explained - for those who serve in the Curia and would like to make their consecration or service to the Church more fruitful”. The first of the 12 virtues listed by Pope Francis is that of a “Missionary and pastoral spirit” which is what – he said - makes the Curia fertile and fruitful, and is what is needed by priests in their daily effort to follow the Good Shepherd who cares for the flock and gives his life to save the lives of others. He goes on to name “Suitability and sagacity” which are also needed for staying away from “recommendations” and payoffs and for putting oneself into God’s hands. Then come “Spirituality and humanity”, “Example and fidelity” which he said – reminds the Curia of its calling to set an example - an example of avoiding scandals which harm souls and impair the credibility of our witness. “Rationality and gentleness”, “Innocuousness and determination”, “Charity and truth”, “Honesty and maturity”, “Respectfulness and humility”, “Diligence and attentiveness”, “Intrepidness and alertness” followed en suite, each of them accompanied by gentle words of wisdom and explanation. And finally: “Trustworthiness and sobriety” – the last – the Pope said - but not the least of the virtues on this list. Sobriety gives us the ability to renounce what is superfluous and to resist the dominant consumerist mentality, to be simple, balanced and temperate, to see the world through God’s eyes. “And so – Pope Francis concluded - may mercy guide our steps, inspire our reforms and enlighten our decisions. May it be the basis of all our efforts. Quoting from a prayer first pronounced by Cardinal John Dearden he reminded his brothers that “we are prophets of a future that does not belong to us”. (Vatican Radio) Pope Francis received the employees of the Holy See and the Vatican City State in a special audience on Monday, to exchange Christmas greetings with them and their families. During the course of the audience, the Holy Father expressed his gratitude to the workers and their families, and asked forgiveness for the recent scandals in the Vatican. The Holy Father also encouraged his employees to cultivate family life. Pope Francis has appointed two laymen—Greg Burke, an American, and Stefano D’Agostini, an Italian—to key positions in the Vatican’s new communications operations. Mr. Burke becomes a deputy director in the Holy See’s Press Office, while Mr. D’Agostini takes over as head of the Vatican’s Television Center. The Vatican made the announcement today, Dec. 21. Last July, after wide consultation, the pope established the Secretariat for Communications and appointed Msgr. Dario Vigano, an Italian and then-director of the Vatican Television Center (CTV), as head of this new structure. Today’s appointments are to be read as some of the early personnel changes in that reform project. Greg Burke, 56, a native of St. Louis and graduate of Columbia University, is a member of Opus Dei. A jovial and outgoing American, he was Fox News’ correspondent in Italy and, prior to that, correspondent for Time magazine, also reporting on Vatican affairs, before Benedict XVI called him to work in the Vatican as senior communications advisor to the General Affairs section of the Secretariat of State in 2012. At that time the Vatileaks crisis was in full flood and there was a clear need for greater professional media assistance at higher levels in the Vatican. In that role Mr. Burke acted with professionalism and fidelity, and gained the trust and confidence of senior Vatican officials. In a letter stamped with the official Jubilee of Mercy theme “Misericordes sicut Pater” [Merciful Like the Father], the Holy See has returned veteran Vaticanist Sandro Magister’s press credentials after they were suspended in July. Father Lombardi added that “together with my colleagues, I warmly wish you good work and all the best in this time of waiting for Christmas.” Magister published the letter on his Settimo Cielo blog Dec. 21. The Vatican took the unusual step of indefinitely revoking Magister’s accreditation July 15 after the Italian Vaticanist published a leaked draft of Pope Francis’ environment encyclical Laudato Si in the Italian newspaper L’Espresso, three days before its official publication which the Vatican had unusually publicized in advance. Doctrinal chief rejects Lutheran pastor's interpretation of Pope's words as "opening door" to intercommunion. Cardinal Gerhard Müller has said Pope Francis’ visit to a Lutheran church in Rome last month was a “sign of hope” for full visible unity, but that his comments were misunderstood as giving the green light to intercommunion because of a failure to take account of the differences between Catholics and Protestants. In Dec. 22 comments to the Register, the prefect of the Congregation for the Doctrine of the Faith said "misunderstandings come up again and again because of a failure to take account of the fact that, unfortunately, there is actually a different understanding of the Church between Catholics and Protestants." These differences, he said, "are not only theological-conceptual, but of a confessional nature." He added that the Church continues in its ecumenical goal to reach “visible and institutional unity” with the Pope as head of the Church. (Vatican Radio) Pope Francis has been awarded the International Charlemagne Prize of Aachen, the oldest and best-known prize awarded for work done in the service of European unification. The announcement was made on Wednesday in the city of Aachen; the Pope will physically receive the award at a date still to be set, in Rome. The Prize is named for Charlemagne, the Franconian king revered by his contemporaries as the “Father of Europe. The Pope – it continues – is a witness for a community based on values which include a sense of humanity, the protection of resources and dialogue between cultures and religions at a European level. To all this – it says - Francis opposes a message of hope. Quoting from his discourse to the European Parliament in November 2014, the communiqué says the Pope’s message is a wake-up call for Europe: “The time has come for us to abandon the idea of a Europe which is fearful and self-absorbed." And again: "The time has come to work together in building a Europe which revolves not around the economy, but around the sacredness of the human person, around inalienable values." (Vatican Radio) Pope Francis will preside at the vigil Mass of Christmas this evening in Saint Peter’s Basilica, beginning at 9.30 pm Rome time. Pope Francis has used these occasions in the past to promote the main themes of his pontificate: the love of God for all and God’s mercy for all. Tomorrow, Pope Francis delivers his Urbi et Orbi message from the loggia of St Peter’s Basilica, as well as his Apostolic Blessing, all of which will be televised live on the Vatican Player and on Youtube, beginning at 12 noon Rome time.